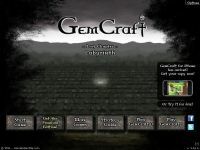 Gemcraft Labyrinth is the third game in the GemCraft series of tower defense games. You create structures and gems using mana to destroy monsters and protect your crystal from being destroyed. Killing monsters grants mana, but letting them hit your crystal takes it away and re-spawns the monster. A lot of the series standards are in place such as completing levels multiple times to maximize your experience allowing you to gain the skills to enable you to beat the harder levels. Gems still come in 8 colors and all the same skills and mechanics exist from the previous games. That being said, a ton of new features have been added. You can build walls to block monster movement, amplifiers to increase the damage done by nearby gems, and shrines to have special effects. There are special monsters that give bonus skill points, and a lot more. This game is the first one in the series to have premium content available for purchase on top of the free elements of the game. While the entire game is playable for free, there will be certain modes and achievements that will be unattainable without purchase. The game is well rated and offers many hours of game-play.